Live wreath topiary is quite different from other kinds of topiary plants. It is more of a short term installation compared to a basic fresh topiary plant, but it has unique advantages. For example, live wreath topiary can be decorated with ribbons and baubles for Christmas or Easter, so they have a festive feel. Fresh topiary is always striking, no matter what form it takes, and wreaths are especially interesting simply because they are less common. It is not every day that your guests will see a wreath with attractive accessories and decorations displayed in someone's home, so it is sure to leave an impression. The wreath does not have the same care requirements as other kinds of topiary plants, so that makes it less difficult to maintain it. Consider a wreath that you decorate heavily, even if it is not related to a specific holiday. It will still look striking and create conversation. Be careful of adding too much color to the point where the plant looks garish, but in general, more is better. 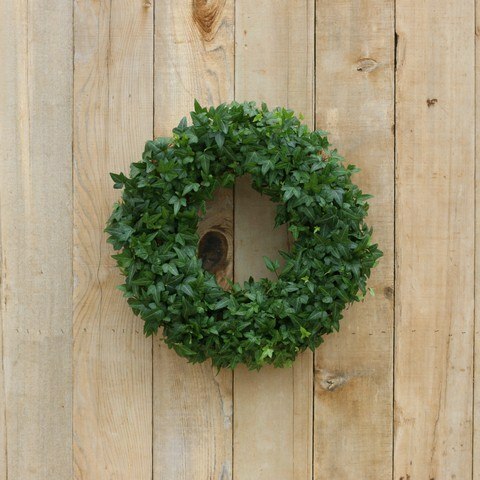 For wreaths in general, it is quite common to add accents like flowers, ribbons, and other bits of color. Specifically, it is known that wreaths are commonly decorated near Christmas and Easter, although it certainly helps to illuminate the plant no matter what time of the year it may be! These are often related to the current season. Done well, this can be a brilliant effect that is enough to elevate an angel vine like this one to the level of being a topiary centerpiece. Having a wreath topiary with angel vines can allow you to release your inner creativity, as there are many different ways to decorate the wreaths. Live topiary plants and displays can take their theme from the wreath. A fresh topiary wreath is not like anything else in the topiary world. Other topiary plants have leaves that branch outwards from the stems. The wreath, on the other hand, has a unique, donut-like shape, so that they immediately draw the eye towards the center. If you are feeling creative, hang something in the middle of the wreath, like a bauble, wind chime, or even a small mirror. These additions will draw even more attention when guests, family, or friends come over to visit; it will be an instant eye-grabber!